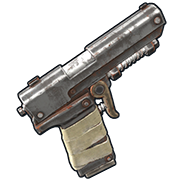 The semi-automatic pistol (commonly referred to as the 'P250' or 'P2') is a fast firing, medium damage weapon that has a moderate bullet velocity and steep damage drop-off. It is an extremely popular weapon due to it's effectiveness at short-medium distances and it's low cost. It can be easily used as a primary weapon or as a compliment to pretty much any other gun. The recoil is bad, so try tap shooting from a far distance. Or get up close. A cheap versatile pistol with a low reload time. Also makes a great sidearm due to its quick draw speed. The ironsights can be a bit all over the place when spraying, though. This weapon can do well at close ranges but is often not used as the Semi-Automatic Rifle can do practically the same, but it is much more effective at longer ranges and is more accurate, making it the better choice.